Two shocking discoveries – her dead husband’s secret novel and a body in Finny’s town square fountain nearly push Ruth to the edge of her sanity. The final kicker comes when her hairdresser goes on vacation to Fiji, leaving Ruth to look like Dickens’ Miss Havisham. 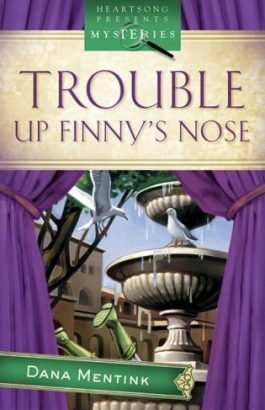 A crazy kaleidoscope of characters such as the uptight gallery owner, Napoleon Prinn; half-baked Dimple Dent, writer of fortune-cookie wisdom; Alva Hernandez, octogenarian newspaper boy; and Monk, the amorous town caterer, add to the chaos in the shadow of Finny’s nose until Ruth finds herself in the ultimate do or die situation.